Enrique MariÑas, s/n, 15009 Corunna, Spanje. 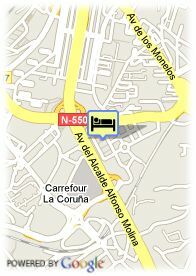 The Attica 21 Hotel is situated in the residential and business area from A Coruña. Faced to the fairground and very next to the Congress Palace, the establishment offers many facilities for its business clients. Furthermore, the beach is located at just one kilometer. The Attica 21 Hotel has 160 large and comfortable rooms. All of them are equipped with TV-set, RDSI Internet connection, safe box and mini bar. 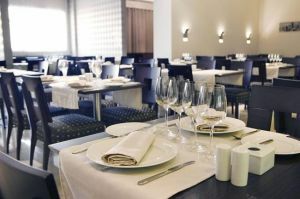 In the hotel restaurant you could taste cared and exquisite dishes from the Galician and Mediterranean cuisine. Moreover, 14 multifunctional meeting rooms are the ideal place where to organize any kinds of events. Sauna, gymnasium, meeting room, business centre and exclusive admission to the Convention Centre finish the offer of this establishment from A Coruña.The Attica 21 Hotel is situated in the residential and business area from A Coruña. Faced to the fairground and very next to the Congress Palace, the establishment offers many facilities for its business clients. Furthermore, the beach is located at just one kilometer. The Attica 21 Hotel has 160 large and comfortable rooms. All of them are equipped with TV-set, RDSI Internet connection, safe box and mini bar. In the hotel restaurant you could taste cared and exquisite dishes from the Galician and Mediterranean cuisine. Moreover, 14 multifunctional meeting rooms are the ideal place where to organize any kinds of events. Sauna, gymnasium, meeting room, business centre and exclusive admission to the Convention Centre finish the offer of this establishment from A Coruña.